Welcome to Day 5 of the 31 Days 31 Printables series. Sunday is my planning day. Every Sunday afternoon I make up a cup of tea and plan our week. Some weeks this is as easy as checking the calendar and noting down anything of import into my personal planner. Other weeks it means paying close attention to the schedule so I can make sure we don’t forget anything. Ok to be fair, so I don’t forget anything. 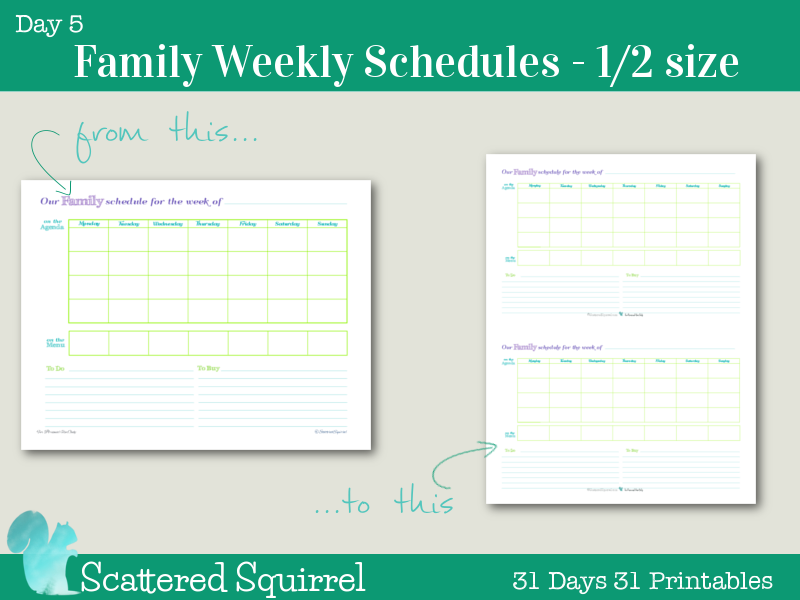 So, since it is Sunday it seemed fitting to share the newest addition to the planner printables; the half-sized Weekly Family Schedules. 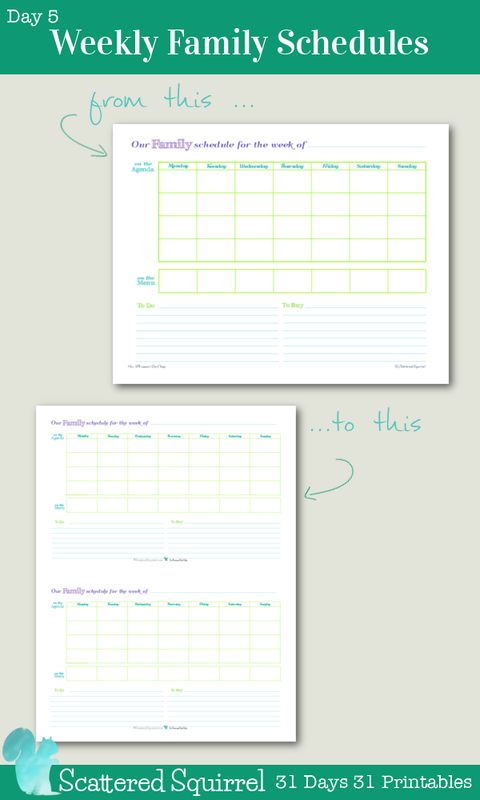 Waaaay back in October 2012, I shared my Weekly Family Schedule printable. (as seen below) I was using it as part of our family command center to help keep me on track. It worked so well, that I still use it even though we have a new command center that doesn’t have room for it. I keep a few of these in the back of my planner and pull them out when we have a week where we are all busy with various things. This really helps me stay on top of who is doing what and where they need to be, or will be etc… It’s been a huge help keeping organized during those chaotic weeks. 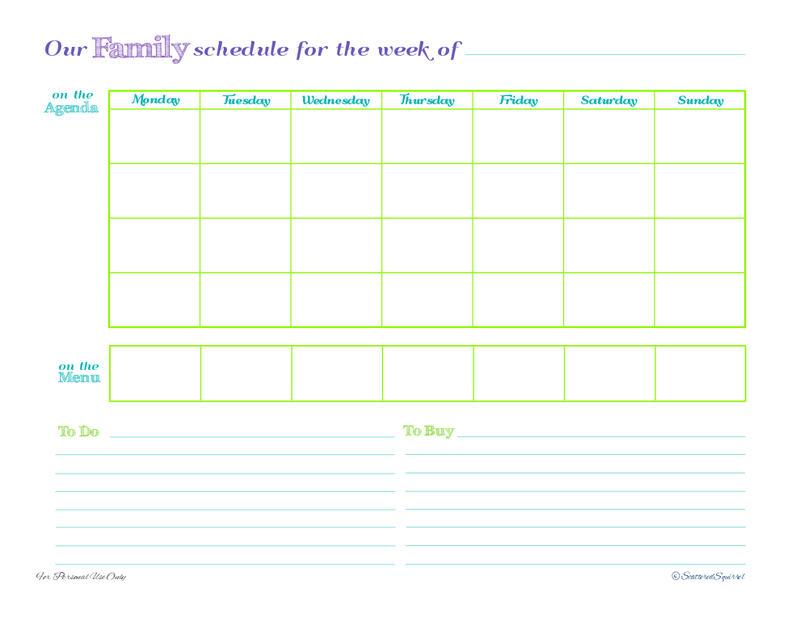 …your printable “Our Family schedule for week of”. I printed it and it’s PERFECT for my needs, except I need it in half sheet. Does is come in half sheet or just full sheet. My planner is half sheet so I can throw it in my bag when I go to work. My heartfelt thanks goes out to the person who sent in this request. Sometimes we cannot see the obvious even though it is right in front of our noses. I really don’t think it needs much explanation, but I’ll just do an overview in case you’re wondering what is what. 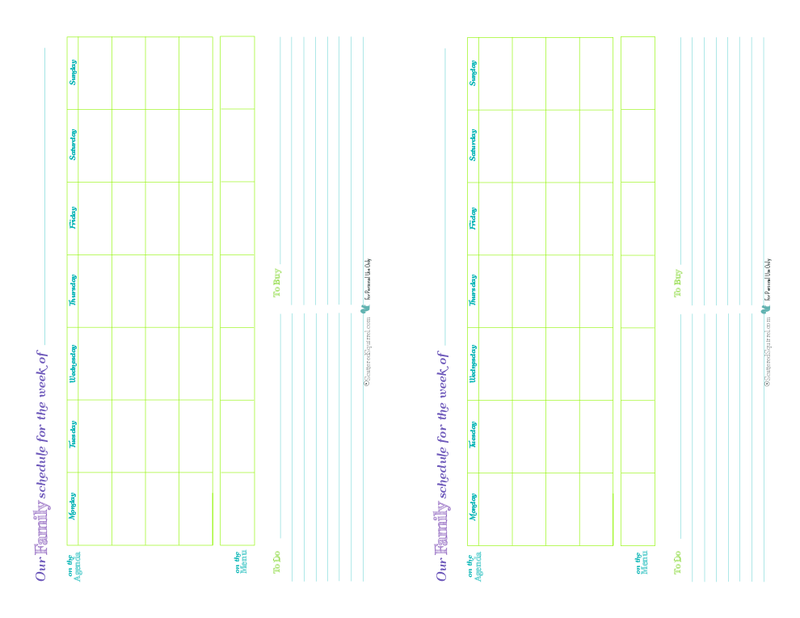 Like my other weekly planner printables, this ones goes Monday to Sunday. And of course, the list spots for jotting down anything I need to remember, or remind someone else, to do and anything we may need to pick up, especially those things we run out of during the week. And now, all the goodness of the full-size is available in the half-size! When you get right down to it, this is just a simple, typical planner page, but it has been such a huge help in keeping me on track during our busier weeks. I hope you find it helpful too. Do you have busy weeks where everyone seems to have lots going on? How do you stay on top of it all?